Silver City, N.M. - It looks like just another bureaucratic meeting. Thirty or so miners and mine supporters, along with an outnumbered bunch of environmentalists, sit uncomfortably in a stifling room. In front, a row of corporate mine-reclamation experts and lawyers, armed with piles of technical reports and mind-numbing Power Point presentations, drone on into the late August afternoon. Maps and charts cover the walls. Rows of fluorescent lights buzz like small squadrons of cicadas. But beneath the apparent torpor flows an electric undercurrent. The fledgling, aggressive 1993 New Mexico Mining Act is out for its first major test drive, and the suits lined up at the Phelps Dodge Mining Company table don't like the direction it is headed. They are at the table because the mining act requires the company to have a cleanup and closure plan for two of the three giant copper mines it operates in Silver City. The plan is due by the end of the year. A few weeks earlier, New Mexico state regulators shocked the Phoenix-based multinational, telling the company that it should expect to post a $759 million financial assurance bond to pay for the reclamation of its Chino copper mine. A similar bond would be required for Phelps' nearby 6,000-acre Tyrone copper mine. In the world of reclamation bonding, these figures are astronomical. Most mining companies operating in the American West are assessed millions for reclamation, but here, in the heart of New Mexico's copper-mining country, state regulators seem ready to take it to a new level. The drama has the industry's attention. Also watching is an increasingly sophisticated environmental community that hopes to make large reclamation bonds standard practice throughout the West. This is the last of six public hearings, and the Phelps Dodge experts tell the state Department of Environmental Quality officials that bonds this large will take a big bite out of the company, whose mining division had $5.9 billion in assets and $3 billion in revenues last year. They then outline their proposal for turning the mile-wide gash of the Chino Mine into an environmentally safe and stable landscape. A $99 million bond will do the job, they say. "The bottom line is clean water, clean air, but do we have to pay for a Cadillac to get there?" asks company supporter Bill Van Dran. The activists speak up for the $759 million bond: "This is the legitimate cost of operating a responsible business and protecting the taxpayers," says Harry Browne, director of the 300-member Gila Resources Information Project. "Phelps Dodge is free-riding, and it's not fair to others who are being more responsible." For most of the last century, mines weren't expected to clean up their own messes. The federal 1872 Mining Law, which still governs mining on public lands, provides no guidance on the subject of reclamation. Until the 1970s, most Western states had no reclamation laws on the books. The new laws passed by state legislatures in the following decades were a definite improvement, but they often lacked regulatory teeth, allowing mines to make largely cosmetic changes to the landscape after their operations closed. The volatile and destructive nature of ore-mining has been known since gold-rush days. Mining companies have always come and gone, and the mountains of exposed ore they leave behind almost inevitably bleed toxic runoff that kills streams and seeps into groundwater (HCN, 9/16/96: The filthy West: Toxics pour into our air, water, land). According to the U.S. Environmental Protection Agency, mining pollution has damaged 40 percent of all Western rivers. Federal and state regulations left the cleanup of most mines to local taxpayers or to federal taxpayers under the Superfund program. The West is littered with this legacy. Nevada's recently bankrupt Yerington Mine could cost $60 million-$80 million to reclaim. The Superfund cleanup at Colorado's Summitville Mine is pushing $170 million (HCN, 6/19/00: Colorado considers a mining ban). Cleaning up the Butte, Mont., mining district could go as high as $1.5 billion. The Mineral Policy Center estimates the total cost for reclaiming abandoned mines across the country at $35 billion. Environmentalists have used the steady stream of mining disasters to support their efforts to rewrite the 1872 Mining Law. When the U.S. Senate shot down reform efforts yet again in 1993 and 1994, activists turned their attention away from the broad legal battle and toward specific mining battles in the West, says Bill Mitchell, an HCN board member and program officer with the Seattle-based Brainerd Foundation. This direction was confirmed at a recent regional gathering of activists this November in Albuquerque. They homed in on reclamation bonding. The issue seemed ripe because the mining industry has come to accept reclamation, at least at some level, as part of the cost of doing business. Furthermore, the public understands the financial implications: When the companies don't adequately clean up mine sites, taxpayers are left holding the bag. To better understand the issue, the National Wildlife Federation decided in 1998 to fund a report on how states in the West were implementing reclamation bonding for hardrock mines. For help, the group turned to a burly, 41-year-old mining engineer from Montana who consults for the Bozeman-based Center for Science in Public Participation. Jim Kuipers was uniquely qualified for the job. He began mining when he was 12 years old, working underground with his grandfather. By 16, he was a fully trained underground miner. After earning a degree in mining engineering from the Montana School of Mines, Kuipers worked at every level of the industry for 13 years throughout the Western United States and Canada. "I grew up mining during the summers near Cooke City (Mont. ), a hundred yards from the wilderness border. I spent evenings and time off traipsing around the wilderness, fishing, hiking. I was trained to be a mining engineer, but my personal life focused on outdoor recreation. For me, over the years, it became a constant conflict - I'd do one thing and realize it was impacting the other." When the Austin Gold Venture Project he worked for in Nevada went broke in 1989, it left behind a big hole in the ground, acid generation that will last for decades, and a bad taste in Kuipers' mouth. Later, working at the corporate level for West Gold, Kuipers proposed a then-novel idea for the industry: complying with environmental regulations. It would make permitting easier, and "the economics were about the same," he says. "But they would rather spend money fighting environmental regulations than do the right thing." The final straw came in 1993, when Kuipers went to El Salvador to re-open a cyanide-leach gold and silver mine for Denver Mineral Engineers. The previous operation had dumped its tailings directly into the Santa Rosa River, still used by the downstream community of Santa Rosa de Lima for bathing and washing clothes. "There were people dying from metal poisoning," Kuipers says. "I proposed a tailings impoundment that would cost over a million dollars, but the president (of the company) said, 'No, too much money.' I came back with a new design for $250,000, but (the president) still didn't want to, because he 'didn't have to.' " Finally, Kuipers' employer told him, "Come back with a $10,000 permit that allows us to discharge into the river." At about the same time, a colleague's wife asked him, "With all the talent and drive you have, why don't you do something good for the environment?" Kuipers left the mining business in 1995 "with the idea of never working in the industry again, never digging another hole." He returned to Montana just as the state was embroiled in a major battle over mining-caused water pollution. Activists and industry were gearing up for a vote on a statewide ballot initiative that would force mining companies to more thoroughly clean up wastewater before discharging it into rivers and streams (HCN, 2/5/96: Miners seek jackpot). Kuipers lent his help in the reform effort. It failed, but Kuipers had found his calling. He began consulting with environmental groups. And eventually he hooked up with the National Wildlife Federation and began working on the reclamation bonding report, funded by the Brainerd Foundation. 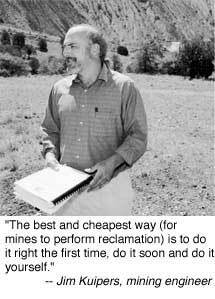 Kuipers had worked on some 20 mining reclamation projects, so he knew the basics: Mine reclamation in the U.S. is largely a state responsibility, no matter who owns the land; and each state sets its own environmental goals for reclamation, based on the laws it has on the books. Reclamation standards vary widely, from Nevada's minimalist approach of planting a little vegetation to New Mexico's requirement of a "self-sustaining ecosystem" (see story page 14). He also knew that the size of the reclamation bonds required by state regulators generally does not reflect the work it takes to meet those goals. But the gap he discovered was astounding: Most states underestimate bonds by at least 50 percent, he found, with the total unfunded liability throughout the West from operating mines in the tens of millions. Even worse, he says, some states accept a corporate letter of guarantee as bond, which is worthless if the mine goes under. When Kuipers' 402-page guide to Hardrock Reclamation Bonding Practices in the Western United States came out in early 2000, state regulators and mining activists reached for it as if it were the latest installment of Harry Potter. Among them was the Gila Resources Information Project, a small group of environmental activists who live in the shadow of the Phelps Dodge Mining Company in Silver City, N.M.
"We recognize how important mining is to this community, and it's definitely not our goal to shut it down," says current director Harry Browne. But GRIP does want to warn the community that it should start looking to a future after the mines have closed, a future that includes fully reclaimed mine sites. 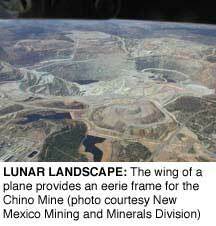 First on the group's agenda is the Chino Mine's Santa Rita Pit, a mile-and-a-half-across, 1,800-foot-deep crater surrounded by mechanically tiered mountains of waste rock. Down the road lie hundreds of millions of tons of tailings spread over almost six square miles. According to the 1993 New Mexico Mining Act, all this must be cleaned up and reclaimed "to a condition that allows for the re-establishment of a self-sustaining ecosystem ... appropriate for the life zone of the surrounding areas." New Mexico also enforces stringent groundwater quality standards, easier to do with the extra leverage of the new Mining Act. When GRIP began its push to apply the act to the Santa Rita Pit, its members had already seen the power of these regulations elsewhere in New Mexico. In the little town of Questa, activists had negotiated a cleanup and closure deal with the state over the giant Molycorp molybdenum mine. The deal includes two proposed reclamation bonds totaling $152 million. If the bonds go through, they will be the largest in American mining history. But the activists had also seen what a grueling and expensive fight Molycorp became (HCN, 8/28/00: The mine that turned the Red River blue). To coordinate the push for strong implementation of the state mining act, GRIP and other activists formed a loose alliance to share resources and expertise. The New Mexico Environmental Law Center, which represents the activists fighting Molycorp, was part of the team. When the Center's Doug Wolf agreed to take on Phelps Dodge, he suggested that GRIP hire the same technical expert who helped in the Molycorp case: Jim Kuipers. 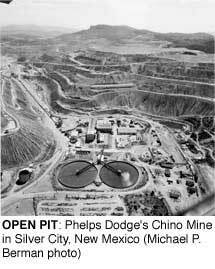 Kuipers' job was to calculate what it would take to reclaim the Phelps Dodge Chino Mine to New Mexico Mining Act standards. He nurtured a working relationship with state regulators, sending them documents and occasionally meeting with them face-to-face. This approach was foreign to the activists, who usually found themselves on the outside, watching industry work with the regulators. "He's been absolutely crucial," says GRIP director Harry Browne. "We wouldn't have done squat without Jim." On June 28, GRIP released its plan for Chino. The work would require a $987 million bond. A week later, the state surprised everyone with its figure of $759 million. New Mexico sets bond amounts to cover the cost of a third-party contractor * the most likely scenario if a mine goes belly-up. That is about twice the cost of the company doing the work itself. The mine can whittle down the bond by $2 for every $1 of reclamation work it does either before or after closure. The figures shocked everyone, even Peter Maggiore, secretary of the New Mexico Environment Department, a governor-appointed position. "I don't know that the Legislature, or anybody, understood the implications of the Mining Act when it was passed," he says. Mining and Minerals Division Director Doug Bland echoes that thought, saying that his agency "would not have envisioned bonds of this magnitude." Until the staffers sat down to figure out the Chino reclamation plan, no one had understood the magnitude of the work to be done. Indeed, of the 200 or so mines already permitted and bonded under the new law, none have come close to matching the Phelps Dodge estimates. But that's because the state has dealt with the smaller and simpler mines first, says Bland. The handful of mines that remain to be permitted are the largest and most complex, he says, and the deadline has been twice extended to accommodate them. Phelps Dodge proposed a reclamation bond of $99 million for Chino, insisting that would be enough to meet the legal requirements. After seven years, $8 million and over 20 expert consultants - numbers drilled into the audience throughout the hearings - the company has created a pile of technical documents 10-1/2 inches high, says Phelps Dodge spokesman Richard Peterson. By comparison, the state's reports are only three-quarters of an inch thick. "Numerous people are very proud of the work we've put into this," Peterson says. At the August public hearing, the differences between the state and the company become clear. It boils down to what and how much reclamation must be done. The biggest area of contention is how to deal with long-term groundwater contamination from acid-generating material in the open pit, waste dumps and tailings. The state and GRIP want Phelps Dodge to regrade its waste dumps into gentler slopes that won't erode. They also want the company to pull some of the material back into the pit, cover all of it with two feet of non-acid-generating material and 18 inches of topsoil, and then replant native vegetation over the whole expanse. That will stop most of the acid mine drainage, but not all. To take care of the rest, they want a water-treatment plant that will run indefinitely to intercept contaminated groundwater, clean it and pump it back into the ground. Phelps Dodge proposes to get a waiver to leave the waste-dump slopes as they are, and to cover only flat spots on the tops of the waste dumps and tailings with a total of 18 inches to two feet of coarse local soil - no pushing rocks around, no resloping, no backfilling. The company will deal with the rest of the problem by intercepting the contaminated groundwater, treating it partially, diluting it with 9,000 acre-feet a year of clean aquifer water and pumping that solution - which would barely meet water quality standards - back into the ground. "I don't have a single good thing to say about the plan at this time, unfortunately," says Kuipers. "It still has many iterations to go through." Maggiore says, more cautiously, "We have questions about whether what they propose will be enough. I want to see the mines continue to operate, but there are laws and rules I have to make sure are complied with." Peterson says simply, "Our plan will fully and adequately meet the requirements of the Mining Act." The activists and agency representatives are most upset by the plan's water dilution proposal. "PD won't have to clean up the mess it's responsible for, and the Mimbres aquifer will be unnecessarily depleted," says GRIP director Browne. "Here we are talking about damming the Gila (River) and importing (Central Arizona Project) water from Arizona for our future needs, (while) letting PD pump 9,000 acre-feet per year of perfectly good water just to dilute the water the Chino Mine will be contaminating for centuries." Silver City's annual water consumption is about 3,000 acre-feet. If Phelps Dodge were to fold without any bond in place, says Browne, cleanup would come to $1,500 for every household in New Mexico, based on the state's $759 million figure. But Browne and GRIP are not the only local voices in this debate. Some residents are in the audience to support the only life and economy they've ever known. 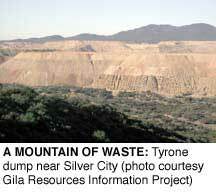 Chino and Tyrone are the fourth- and fifth-largest mines in the U.S., and the largest in New Mexico. The mineral-rich area has been heavily mined since the early Spanish period in the 18th century. "Phelps Dodge is a good neighbor," says one man, adding that the company is the biggest taxpayer in Grant County. "Some people say it's an eyesore," says another, "but for those of us who work there and have raised our families here, we think it's beautiful." Still, at the conclusion of the meeting, activists are cautiously optimistic. The state appears to be sticking to its guns. But Kuipers is less hopeful: "I don't look for this thing to come down well in the end," he says. "The biggest part of (Phelps Dodge's) game is political, which we're locked out of. I think we will be outraged with the decision." Two weeks later, Kuipers sounds like a prophet. In a Sept. 5 press release, the state announces an "agreement in principle" between the agencies and Phelps Dodge, "a compromise" that allows for further negotiations before determining final reclamation requirements and bond amount. "All parties worked very hard to develop a framework that will protect the environment and serve the best interests of the citizens of New Mexico," Maggiore says in the press release. Nobody in the Environment Department or Mining and Minerals Division will talk; they've all had to sign confidentiality agreements on the Phelps Dodge deal. Environment Department Communications Director Cathy Tyson, the contact person on the press release, says, "We are inclined not to talk about it at this point. Negotiations are ongoing and they are confidential, so we can release none of the details." Browne says the deal was cut in Gov. Gary Johnson's office. "How can Secretary Maggiore say that all parties worked very hard on this?" he demands. 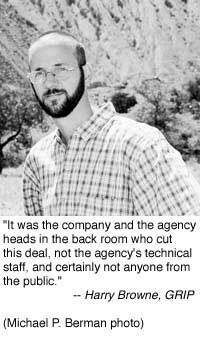 "It was the company and the agency heads in the back room who cut this deal, not the agency's technical staff, and certainly not anyone from the public." According to company spokesman Richard Peterson, the state approached Phelps Dodge about the deal. "For the first time, apparently the state is interested in a cost-benefit analysis," he says, indicating that the state has based its requirements not on reclamation standards, but on what it will take to keep Phelps Dodge in business. The governor's science advisor, Larry Winter - a key player in the negotiations - denies that they're conducting a cost-benefit analysis. "The state has an interest in the health of Grant County's economy, but Phelps Dodge can take care of itself." But in a local radio interview, Gov. Johnson, R, is more blunt: "Well, if we bankrupt Phelps Dodge, we are not going to get any cleanup done whatsoever. Is that a victory? I feel as though in my own conscience as a governor, I had to either side with the state of New Mexico, or I had to side with Phelps Dodge, or I had to fall somewhere in between. And I think, clearly, that we fall somewhere in between on this." Though no one will say that a dollar amount has been decided on yet, Larry Winter ventures an estimate of around $300 to $350 million under the new parameters. "What we did was come up with a process, not an agreement. This negotiation was not one of determining the outcome, but how to reach an outcome." Suddenly, nothing is certain. Phelps Dodge and the state will go back to the drawing board to come up with a crude "base case" reclamation plan to set a preliminary bond, then revisit the plan piece-by-piece, through studies likely to drag on for many years, modifying the bond as they go. Despite years of hard work by Phelps Dodge consultants and the state's agency staffers, almost everything is back on the table. "I can tell you that the (state's) technical staff feels betrayed," says a source who asked to remain unnamed. "All their hard work went down the tubes because this became political instead of technical." Browne and others say they are certain of one thing: that any new reclamation plan will look a lot more like Phelps Dodge's original $99 million proposal than the state's, and probably won't meet the letter or intent of the New Mexico Mining Act. Still, the activists don't feel entirely defeated. The fact that a state agency considered a reclamation bond of this magnitude is a victory. "We're definitely a lot further along than we were two years ago," says Browne. Mining has never been a secure occupation. That point is driven home in October when Phelps Dodge announces it is closing its Chino operation at the end of the year due to a slump in copper prices. The company will indefinitely drop some 650 jobs. As long as it's cheaper to produce copper somewhere else, stringently regulated domestic producers are at a disadvantage. Jack Gerard, president of the National Mining Association, recently told the New York Times that the U.S. has become seven times more dependent on foreign sources for minerals since 1993. Bill Van Dran, chairman of the pro-mine Citizens for Economic Growth and Environmental Protection, has calculated that carrying a $759 million bond, even amortized over 20 years, will increase costs at Chino by 16 cents a pound. With the price of copper at about 60 cents a pound, down from $1.35 six years ago, that's a huge hit. With these concerns in mind, Jim Kuipers asks a question that might make him as unpopular among some environmentalists as he is with Phelps Dodge: "Should society at large be carrying part of the (financial) load because of the benefits we've all shared from copper?" After all, he says, we have driven the copper industry through our consumption. Browne comes at the same question from a slightly different angle. "Markets should reflect the true cost of producing something. If part of the cost is protecting the environment, I feel like I should be paying for that." To create a level playing field on the international market, he says, "We need international standards for bonding, so a competitive market would reflect the social and environmental costs, so we know what we are paying for." In other words, Kuipers and Browne, each in his own way, want the larger society to accept some responsibility for reclamation. But, getting consumers to pay more even for recycled toilet paper, much less industrial metals, is a tough sell. Strong reclamation standards pose a new challenge that could drive some companies out of business, or out of the country in order to exploit lax regulations elsewhere. But Kuipers believes industry can learn to operate in a regulated environment. "The best and cheapest way (for mines to perform reclamation) is to do it right the first time, do it soon and do it yourself," says Kuipers. "I'm not interested in politics; I believe you can provide solutions and answers through science." He predicts, "We'll see in the industry a separation between those companies making an effort and those that don't. Those that make an effort deserve our support." Already, Kuipers is thinking of more ways to usher in a new era of mining reclamation. He plans to write a nuts-and-bolts book for activists, regulators and industry that highlights the most innovative reclamation work going on in the country. "The challenge to the mining industry is to take all their hard work, innovation, can-do attitude and pour that into sound environmental reclamation. I have no doubt they'll succeed, as they've always succeeded with technical issues." Maybe it's a pipe dream, or maybe Kuipers will be as prescient about this as he was about the political ambush of the Phelps Dodge deal. Writer and activist Ernest Atencio lives in Arroyo Hondo, New Mexico. This coverage of mining reclamation in the West is supported by the True North Foundation. Phelps Dodge Corporation, 505/538-3553, www.phelpsdodge.com.